We've had a surplus of fresh eggs around here lately thanks to my sister-in-law and Yancey's co-worker. God bless all those loving souls who build cozy chicken coops, buy chicken feed, and then give their hard-won eggs to us. I never get tired of eggs in all their forms--softly scrambled, soft-boiled, hard-boiled, sunny side up or over easy. But mostly, as you may know by now, broiled. Sometimes I don't eat breakfast with the kids in the morning. I'm too distracted making their lunches, remembering to drink a cup of coffee, asking them to brush their teeth and round up their homework. So I'll come home after dropping them off, scrounge around in the fridge for vegetables, and sit down to something like this. Heaven. Preheat broiler. Get out an oven safe small skillet--cast iron or carbon steel like the crepe pan pictured here. Pour a little olive oil into it and pile as many veggies as you can into it, adding more as they wilt down. Here, I've used finely chopped broccoli florets, a whole red pepper, and some roasted asparagus from the night before. (You could use raw.) Greens (spinach, cabbage, kale) are great for this, too. Once everything has wilted down a bit, salt and pepper to taste, distribute it evenly across the pan, and crack two eggs over the top. Scatter some cheese over (sheeps milk feta here) and some fresh herbs or interesting dried ones (I've used Syrian Zaatar here). When eggs have begun to set (3 or 4 minutes) put the whole thing under the broiler till it bubbles and eggs are cooked to your liking. Put onto a trivet and eat straight from the pan. If you're making it for two people, use four eggs. 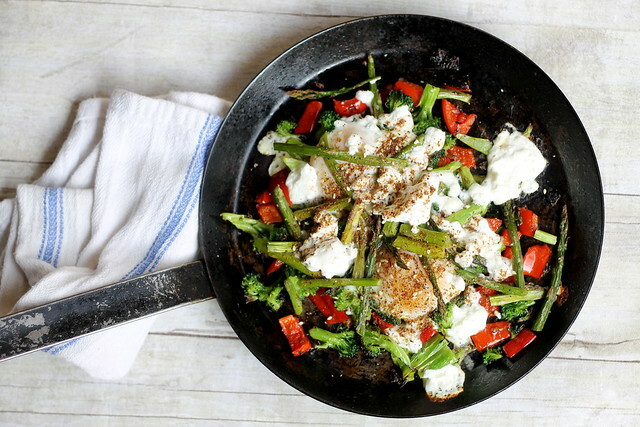 If you're making it a for a bunch of people, use more of everything and a big cast iron skillet.